The success of Twitter has inspired a lot of developers to create their own Twitter mashup. TweeSpeed is an example of this phenomenon. 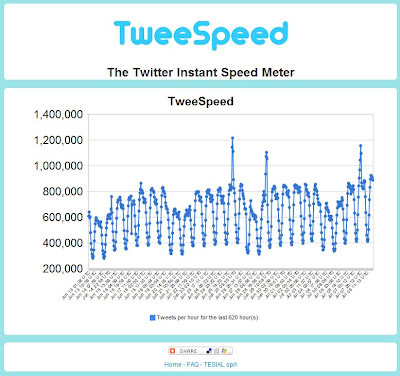 TweeSpeed is a web service that calculates the number of Twitter messages, also called tweets, sent in the last minute. TweeSpeed is based on the public timeline, it grabs information for the 5 last minutes and calculate an average speed for one minute. The actual number of Twitter messages is higher, Twitter messages from private accounts do not show up in the public timeline. 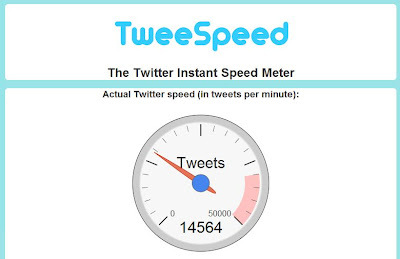 TweeSpeed offers three views of the number of Twitter messages per unit of time. There is the gauge at the front page. There is also a view of the speed by minute for the last day. And finally there is a view of the speed by hour for the last week. The events around the death of Michael Jackson had a strong impact on Twitter, as already reported by the traditional media such, e.g. CNN. Looking at the graphs made available by TweeSpeed, I discovered that it was possible to show more history that just the last day or the last week. The graph below starts at June 13, 2009. The rumors and the formal announcement of the death of Michael Jackson caused a sharp increase in the number of Twitter messages on June 25, 2009. The next peak was on June 29, 2009 - when all kind of rumors concerning the cause of death and the funeral arrangements were spreading around. The funeral and memorial service on July 7, 2009 triggered the third peak. The graph shows also a cyclical trend. The volume of Twitter messages in the past four weeks is significantly lower on Saturdays and Sundays. The peaks occur typically around 20:00 UTC (Coordinated Universal Time), which is around 16:00 US Eastern time and also 13:00 US Pacific Time. The volumes of Twitter messages are at their lowest level between 11:00 and 12:00 UTC, which is around 7:00 and 8:00 US Eastern time and also 4:00 and 5:00 US Pacific Time, when the majority of the population in the United States is probably still sleeping. It looks like Twitter users from the United States are still dominating Twitter usage. Coincidentally, the volumes of Twitter message are at their highest levels during the working hours. Does this mean that Twitter users (especially in the United States) are still allowed to Twitter during working hours ? A poken is a small physical device capable of exchanging online social networking data with other poken devices. A poken has a USB connector, so you can plug the device into your computer to connect your device to the Poken web database. On the Poken website you can decide which social networking profiles you want to share with your Poken friends. This social network profile can be your Twitter account. If two poken devices are held close to each other, they will exchange contact data of the owners. Pokens are produced by a Swiss company. The inventors of this device saw it as a digital alternative of exchanging business cards. Pokens were launched in the last trimester of 2008. They became pretty soon a hype in the Netherlands. Only in March 2009 this device got attention on the TechCrunch blog. Pokens were also presented at the SXSW conference, where they became talk of the conference - as Twitter was during the 2007 edition of SXSW. I have been tracking the buzz on Twitter regarding pokens for a while now. You can find below some graphs showing insight on how the poken hype evolved over the past months. This analysis was performed on data obtained thru Twitter Search. Only Twitter messages from public Twitter users were available for analysis. Since September 2008 I discovered over 31,000 Twitter messages from 7641 different Twitter users. The first graph shows the number of Twitter messages per day related to poken. 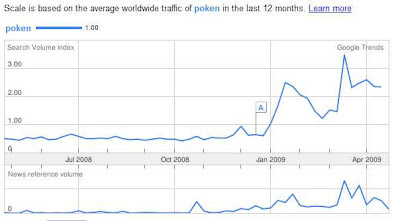 You can compare this graph with the result of Google Trends for Poken - showing the usage of the term in searches. 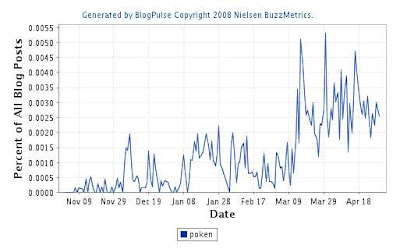 Another reference chart is the number of blogposts found by Blogpulse refering to Poken. The hype on Twitter started before the hype on blogs (shown on the Blogpulse chart) and the hype in search trends (Google Trends). Another interesting graph is the cumulative number of Twitter users who posted at least one Twitter message related to poken. This graph shows that the number of users is still increasing. I tried to link the 7641 different Twitter users to their location, their country - based on the information in the Twitter profiles. A similar distribution can be found in the information for Google Trends for Twitter. Both lists are dominated by The Netherlands. Swiss internet users search often for poken, however Twitter uses from Switzerland are less active, they are only ranked 7. The hype in the different countries can be observed in the graph showing the number of Twitter messages related to poken. 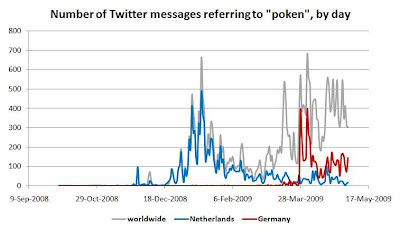 Twitter users in the Netherlands started posting Twitter messages related to poken from December 2008, with a first peak around mid January 2009. 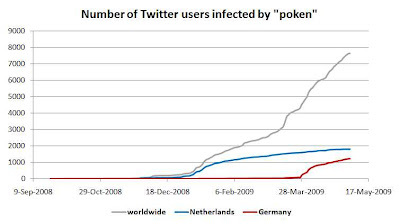 Since then the hype around Poken has faded away within the Dutch Twitter user community. 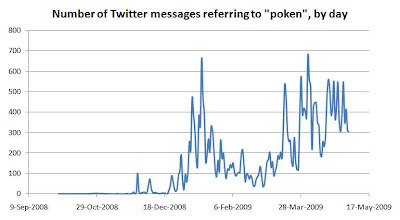 Twitter users in Germany picked up the Poken hype around mid March 2009, with a first peak on March 28. The hype is still continuing at a rate of about 100 Twitter messages per day. 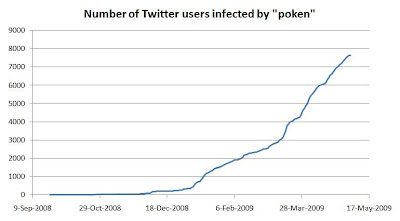 A similar pattern can be observed in the graph showing the number of Twitter users having posted messages related to poken. Currently there are more Twitter users in the Netherlands who have posted Poken related Twitter messages, but it the trend continues there will be soon more German Twitter users. Twitter messages related to poken came from over 70 countries, from all over the world. 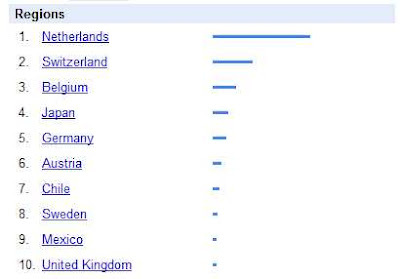 There came from the Netherlands and Germany (as can be observed in the graphs shown above), from Japan and the United States, but also from countries such as Argentina, South Africa, New Zealand, China and Malaysia. Dedicated Twitter accounts for Pokens have been set up in different countries : Belgium, Germany, Italy, Japan, Slovakia, Spain and South Africa. The initial idea of Jack Dorsey that resulted in the development of Twitter is available on Flickr. This idea dates back to 2000, when Jack Dorsey signed up to Livejournal. The current wikipedia article on Twitter states that Twitter began as a research project in March 2006 at Odeo, a podcasting company. The first tweets of some of the oldest Twitter users are still available. The first tweets were published on March 21, 2006, exactly 3 years ago. Happy Birthday Twitter. On January 23, 2008, a 20 year old man forced his way into a child day care center in Dendermonde, a small town in Belgium, Europe. He attacked the staff and the little children in the child day care center with a knife. One staff member and two babies were killed, several other staff members and babies were severly wounded. The agressor managed initially to escape, but he was arrested 90 minutes later. Very quick the news of this horrible attack found its way to Twitter. As soon as the attack was mentioned on websites of Belgian newspapers, Twitter users picked up the story and expressed their agony in their Twitter messages. Later on the articles on Belgian news sites were also announced on Twitter, in Twitter messages that were automatically created. The news about this horrible attack became also known to news agencies, newspapers, radio and television stations and news aggregators worldwide, who also published it on their Twitter accounts. Using Twitter Search, I traced the Twitter messages containing the words "Dendermonde" or "Termonde" - the French name for Dendermonde. From October 2008 until the moment of this writing, these words were mentioned in 1450 Twitter messages from 409 different Twitter users. 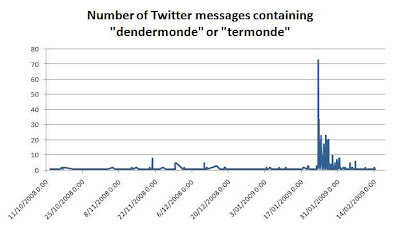 The graph below shows the number of Twitter messages containing the words "Dendermonde" or "Termonde" per hour. The peak on the graph is the hour after the stabbings were commited. Later smaller peaks occured when new facts about the agressor became public and when the funeral services for the victems were held. As can be expected, a large part of these Twitter users can be located in Belgium. Belgium is followed by the Netherlands and France, neighbouring countries of Belgium. There were also Twitter users from countries far from Belgium announcing the horrible facts, e.g. Switzerland, Austria, Norway, Portugal and Serbia in Europe, also in the USA and Canada, in Brazil and South Africa, and also in Asia (Malaysia, Philippines). 74% of the Twitter messages containing the words "Dendermonde" or "Termonde" contained a hyperlink to a story on a newssite or a blogpost. The most productive Twitter users turned out to be Twitter users from news agencies, newspapers, radio and television stations and news aggregators. The 409 Twitter users posting messages containing the words "Dendermonde" or "Termonde" have in total over 100,000 followers. As Twitter Search is only capable of finding Twitter messages for public Twitter users, the total number of Twitter users who published messages containing the words "Dendermonde" or "Termonde" will probably exceed 409. The total number of Twitter users who were potentially informed of the horrible facts on January 23, 2009 at Dendermonde will probably exceed 100,000. This analysis of this event shows that traditional media have discovered their way to Twitter. A large part of the messages published after the dramatic stabbings were indeed automatically published by these Twitter news accounts. News travels also far and travels fast. Within a couple of hours Twitter users from locations far outside Belgium also twittered the horrible facts. Currently the storm caused by the horrible facts has faded away. Life in and around Dendermonde has returned to its normal state. Unfortunatly several families will have to live with the tragical loss of life. There are no official figures of the number of Twitter users. Estimations go up to 8 million. As the number of Twitter users increases daily, new Twitter users find out that it is not easy to find a Twitter name that is still available. I had a close look at the shortest Twitter names, these consisting of only 1 and 2 characters. All 1 character long Twitter names are currently taken. 6 of these 37 Twitter names (A-Z, 0-9 and underscore) are private Twitter accounts, 4 of these Twitter names are without updates. There are 1369 Twitter names of 2 characters long - all combinations of A-Z, 0-9 and underscore. The good news is that 76 of these combinations are still free. 205 of the 2 character long Twitter accounts are private, 41 are suspended due to strange activity. 296 of the 2 character long Twitter accounts are still without updates. The oldest 2 character long Twitter account is twitter.com/ev. It is the Twitter account of Evan Williams, one of the founders of Twitter.com. Other famous 2 character long Twitter accounts are ie - IE (yes Internet Explorer), twitter.com/om - Om Malik and twitter.com/f1 - Formula 1. Some of the 2 character long Twitter account are cleary fake accounts, e.g. twitter.com/sf - San Francisco, but without friends and updates, twitter.com/fr - Francophonie, "voulez-vous coucher avec moi ?" and twitter.com/uk - no meaningful name or bio, but 195 followers. A lot of the 1 or 2 character long Twitter names are taken but not really used. In total there are 1406 combinations. 1289 combinations or 92% taken. Only 473 of these Twitter accounts have a location, 384 of these locations are "real" locations. The 1289 Twitter accounts have on average 49 friends (other Twitter accounts that are followed), with twitter.com/s the Twitter account with the most friends - 11722. 572 Twitter accounts have no friends at all. The 1289 Twitter accounts with a (very) short name are on average being followed by 186 other Twitter users, with twitter.com/ev having the most followers - 98712. 346 Twitter accounts do not have followers. The 1289 Twitter accounts with a (very) short name have on average 405 updates. The most productive Twitter account is twitter.com/zb, with as of this writing 45469 updates. 300 Twitter accounts are still waiting for their first update. Of the 1289 Twitter accounts with a (very) short name 136 accounts stand out as blank accounts, accounts without friends, followers or updates. If you are looking for a (very) short Twitter Name, you are either too late of you will have to hurry to get your Twitter account registered. Or you could consider to persuade the holder of one of the inactive accounts to hand over his Twitter account. Hitwise has published over the last days three posts with interesting information on traffic to the Twitter website. 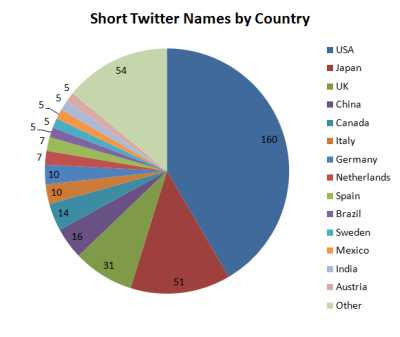 They analysed traffic to twitter.com in three countries : UK, USA and Australia. Let's start with the UK. 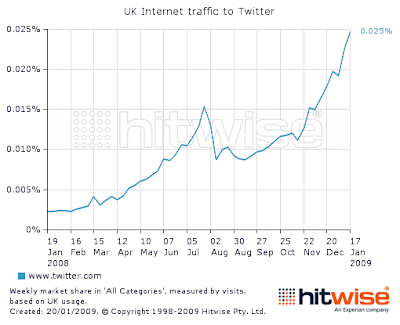 Twitter.com is the 291st most visited website in the UK. Internet traffic has increased by 974% over one year, see the graph below. Hitwise does only taken direct traffic to twitter.com into account. If the people accessing their Twitter accounts via mobile phones and third party applications (such as Twitterrific, Twitterfeed and Tweetdeck) were included, the numbers would be even higher. A few days earlier an analysis of Twitter traffic in the USA was also published. 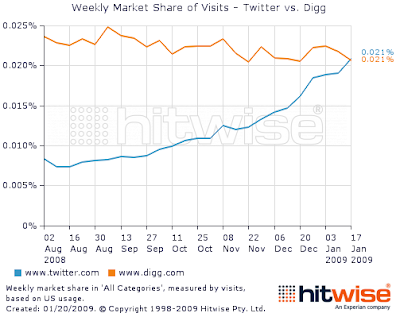 According to Hitwise, Twitter.com attracks more visitors than Digg. Twitter is ranked #84 in computers and internet category, one place before Digg, ranked #85. 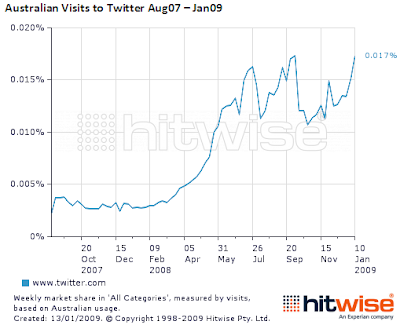 Traffic to Twitter from Australia has also grown significantly, 517.9% up over one year, as shown on the graph below. Twinfluence was one of the first services offering metrics to quantify the influence of a Twitter user. TwitterFriends goes a step further, by offering more metrics and additional information for individual Twitter users. This is the list of metrics calculated by TwitterFriends. Six of these metrics are plotted on a graph, called TwitGraph. 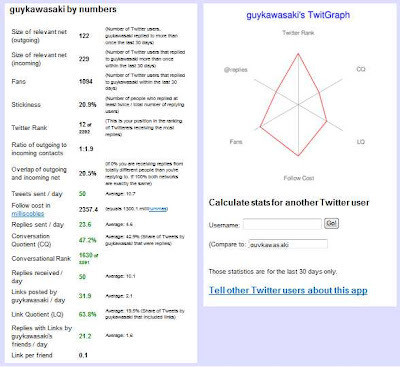 Below you can find printscreens of the results for two famous Twitter accounts : Barack Obama and Guy Kawasaki. Both graphs are quite differently. Guy Kawasaki engages actively in Twitter conversations. 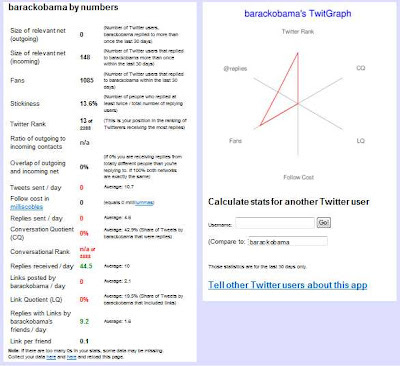 Barack Obama is the most followed user, but this Twitter user does not publish very often Twitter messages and this Twitter user does not reply to twitter messages of its followers. Malaysia is a country in Southeast Asia. In the series of states of the Twitosphere on this blog, I did not yet publish a state of the Twitosphere for a Southeast Asian country. The first question in such an analysis is the number of Twitter users in Malaysia. Twitter user search is already disabled for a while, so I cannot inform you on the number of Twitter users in Malaysia according to Twitter itself. Based on the location info in the Twitter profiles, I was able to find 3429 Twitter users in Malaysia, all active users. These users make an explicit reference to Malaysia, the country itself or a geographical location within this country. Persons who have closed their Twitter accounts are not included in this number. Because the number of Twitter users not mentioning a true location in their Twitter profile is estimated at around 50%, the actual number of Twitter users in Malaysia will probably exceed 3429. With a population of 27,730,000 people (source Wikipedia), the Twitter user density for Malaysia is one Twitter account for every 8087 inhabitants. The graph below shows the history of the Twitter accounts from Malaysia. The graph is based on the date of the first message posted on each of the public Twitter accounts. 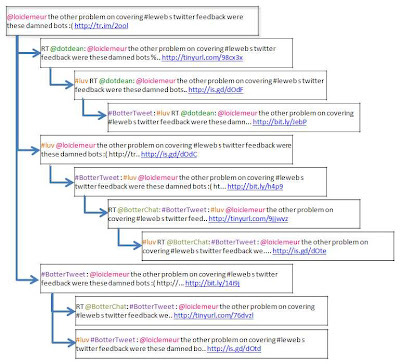 Twitter users who haven't published any messages and Twitter users with a private profile (their messages are only visible for their approved followers) are not included in this graph. Twitter started late in Malaysia. The oldest Twitter users date back from March 2006. 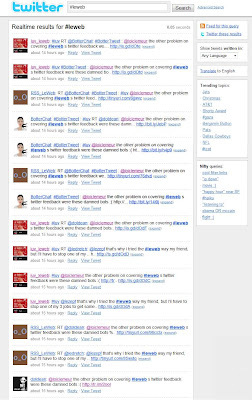 Only 6 months later first users from Malaysia started using Twitter. 309 Twitter acounts from Malaysia or 9% have chosen to keep their updates only available to their friends. A Twitter user can choose to follow one or more other Twitter accounts, called "following". 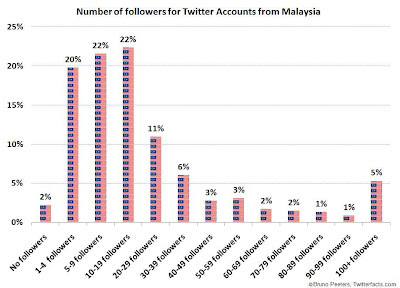 682 Twitter accounts from Malaysia or 20% do not follow other Twitter users. An average Twitter account from Malaysia follows 34 Twitter accounts. A follower is someone who has indicated another Twitter account as following and receives all updates of that other Twitter account. 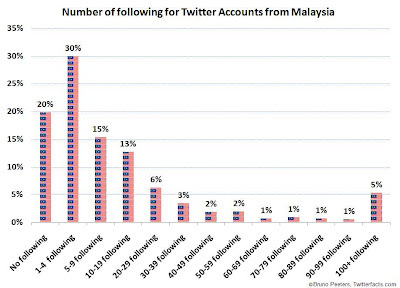 77 Twitter users from Malaysia or 2% have no Twitter followers at all, meaning that no one else on Twitter has indicated this account as following. The messages published by these Twitter users are only read by themselves (and by search engines). An average Twitter user from Malaysia has 31 followers. An update is the term refering to Twitter messages published by a Twitter users. These are also called tweets. 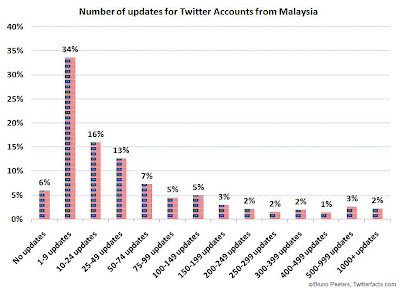 The average number of updates for a Twitter users from Malaysia is 123. 205 Twitter users (or 6%) are still waiting for their first message to be published. Below you can find the top 10. 29% of all Twitter users from Malaysia have publised at least one message in the last 7 days. 41% of all Twitter users from Malaysia have not published a message for more than a month. 9% of all Twitter users from Malaysia is private, so no information on their degree activity is available. On 6% of the Twitter accounts from Malaysia not a single message has been published. The results of the analysis of the state of the twitosphere in Malaysia are comparable to the results for other previously analyzed countries. 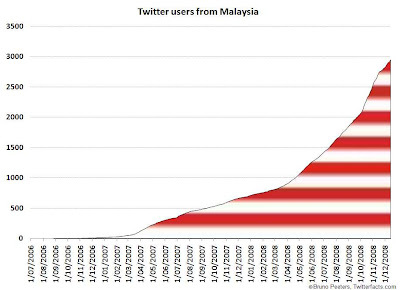 From August 2006 there were a few Malaysian users from Twitter. A first increase in popularity occured around March 2007. A next increase in popularity of Twitter started from April/May 2008, followed by a next increase in adoption speed from November 2008. Compared to the Western European countries the Twitter user density is still lower, so there are probably further a lot of people in Malaysia to be convinced of the use of Twitter.